The news of the Jayalalitha cardiac arrest sent India into a panic as the much loved former film star health news became a concern for many.A big crowd gathered outside the hospital where she was being treated hoping to get the latest status of the politician as rumours of her death circulated in some quarters. The Apollo hospital in Chennai released a statement saying she was being treated after suffering a heart attack on Sunday evening. people and there are concerns that the situation may get out of hand if news that are not favourable to her health should surface.As a result of this,the police are keeping security tight and monitored in Tamil Nadu and outside her official residence. As India impatiently await Jayalalitha health news,the doctors treating her have urged the nation to pray for her speedy recovery.Well,when doctors start asking you to pray,you should start worrying. The controversial Jayaram has served as the chief minister of south India's Tamil Nadu state on four different occasions.She is also renowned for making comebacks just when you think her career was dead and buried. Twice she has been caught up in corruption scandals that once saw her land in jail. In 1996 she ended up in jail for corruption charges.Also in 2014,she was found guilty on the same charges and jailed for 4 years before she was cleared of the charges by another court enabling her to return to power. So she does have 9 lives and this is what her supporters are banking on in their hope that she makes a speedy recovery from her illness. 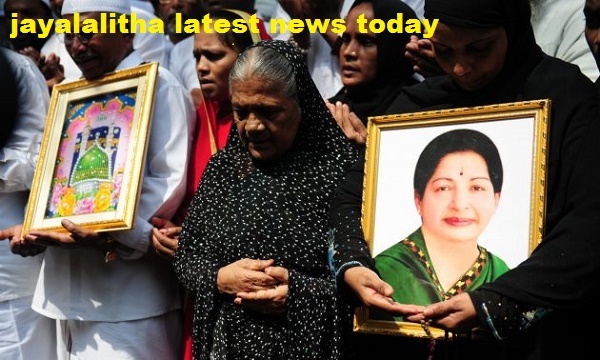 Concerned fans have already been making searches online asking is Jayalalitha dead? But her critics equally have their own ammunition such as accusing her of frittering away public funds with parties,wedding ceremonies,self indulgence and naming her projects after herself with the Amma moniker.Some of these are the projects Amma Bottled Water, Amma Salt, Amma Pharmacies and more recently, Amma Cement. The film former actress who entered the big time political arena in the 1980s is certain to generate a strong reaction if her cardiac arrest leads to her passing away.There will definitely be clashes among rivals who either saw her as a saint or a corrupt self indulging woman. Meanwhile Tamil Nadu and India holds its breath.